"The Reading Shaped Communities" has been chosen as the interpretive theme of the Reading Railroad Heritage Museum. Whether physically shaping a town or city, as how the freight yard and shop complex bisects the City of Reading, or influencing a culture, such as the many "mine patches" in the anthracite coal regions served by the railroad, the Museum will tell the story of the profound and varied impact that the Reading Railroad made on the areas through which it ran during its existence. Visitors will learn about the history and influence of the Reading through a variety of interactive experiences. Upon entry into the Museum, visitors will view a 15-minute video entitled "The Reading Shaped Communities." Professionally produced and including interviews with Museum personnel, the video provides an overview into the history of the Reading, as well as highlighting ways in which businesses, lives and culture were influenced by the existence of the railroad. Throughout its 30-year history, the Reading Company Technical & Historical Society has acquired the largest collection of railroad rolling stock dedicated to a single railroad in the United States. 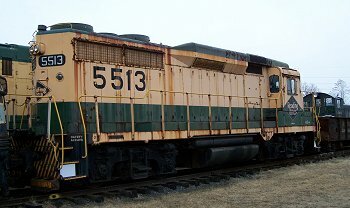 Comprised of over 70 freight and passenger cars and locomotives, the Society's collection includes several historically significant examples of rail equipment, including the first production model of the General Motors GP-30 diesel-electric locomotive, #5513, shown at left. When you visit the Museum, you will have the opportunity to take a walking tour of our outdoor display yard with a Museum docent, during which you will learn about how the Reading had a leading role in the development of railroad technology. You'll also gain an appreciation for the challenges faced by the men and women who worked for the railroad. The Museum's main Exhibit Hall contains a variety of artifacts from the Reading Railroad that showcase the impact the Reading had on the communities it served. The highlight of the Exhibit Hall is our 1930s Station Agent's Office, shown at right. Before the paperwork and "business" aspects of railroading were taken over by computers and electronic technology, most stations along the Reading Railroad had an Agent who was responsible for keeping track of freight traffic and delivering orders from the dispatcher to passing train crews. 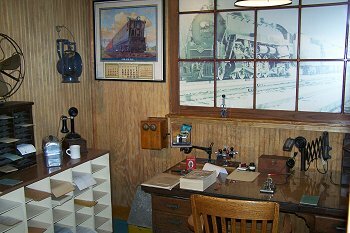 Step back in time and see what life was like for railroad personnel outside of the locomotive cab - our replica office is a realistic depiction of a typical Reading station office from the early part of the 20th century, from the gate-arm telephone to the countless pieces of paperwork that had to be completed to keep the freight moving! "I've been working on the railroad, all the live-long day!" 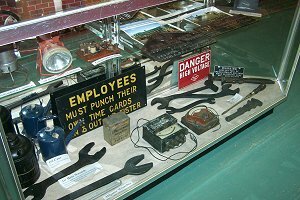 Visitors will continue to learn what it was like to work on the Reading Railroad by viewing our sizable collection of railroad artifacts. From tools to signs to the bass drum from the Reading Shop Band, we have a broad variety of artifacts on display that tell the story of life on the railroad, and how the Reading influenced everyday life - whether by bringing coal to heat homes in the early part of the 20th century, to the famous Reading Terminal Market - built by the Reading under its main passenger terminal in Philadelphia in order to increase business for the railroad. After exploring the exhibits at the Museum, you'll begin to see that the Reading Railroad is so much more than a space on the MONOPOLY board!